A semi-final loss to Fitzroy sees the Blues end up third in a 6-team competition. The Great War continued to play havoc with life at home in Australia, and of course, the football competitions of the time suffered as well. In 1917, 6 Clubs were able to compete, and South Melbourne and Geelong returned to competition after the 4 Club competition in 1916. In all, Collingwood, Richmond, South, Geelong, Fitzroy and Carlton would fight it out for the 1917 Premiership, but it would be Collingwood who would prevail. Carlton would finish second on the ladder after 9 wins from 15 games. The Blues had reached the past three Grand Finals, and were surprisingly bundled out of the finals by Fitzroy in the first Semi Final. We were officially ranked third for the season after the final loss, and the Roys would lose the Grand Final to the Pies by 35 points. "The 'Age' says five League football teams play football this season. At a meeting of delegates all the clubs were represented except Melbourne and St. Kilda, which have definitely decided not to play. Though finality was not quite reached, it is understood that Fitzroy, Carlton, Collingwood and Richmond, the competing clubs last season, will play again this year under the same conditions, namely, that all gate money over bare expenses will be devoted to the patriotic funds. The South Melbourne club committee held a meeting on Monday, 16th inst., when it was decided to to play this year. Geelong club has not yet considered the matter, and Essendon, finding a difficulty in raising a team, is considered an unlikely competitor this year." 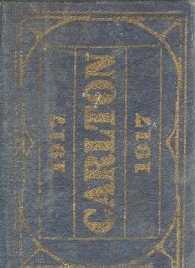 Carlton, 22, Collingwood, 16, Fitzroy, 32, Geelong, 14, Richmond, 31, South Melbourne, 18, Total, 133"
Carlton announced that no player eligible for war sevice will wear their uniform. "By the way Carlton is like the other clubs, well represented in kahki. Three great players - Sergt. G. Challis, S. McKenzie, and F. McDonald have been killed in action. Dug Gillespie (whose brother Dave, the brilliant full-back in Carlton's triumphant years, died of wounds), R. Moran, H. Evans, Don, Starr, Cameron, Parke, H. Mathieson, and Les Beck. Practice match vs Artillery made up of many ex VFL players. Carlton players in the Artillery team; M. Carter, Stockdale, Miller, Roberts, Thompson, Jacobs, A. Sharp, Sharp. Contributors to this page: blueycarlton , molsey , Bombasheldon , WillowBlue , PatsFitztrick , Jarusa , steve and admin . Page last modified on Thursday 15 of March, 2018 22:08:23 AEDT by blueycarlton. 1989 Rd 5 - Mil Hanna fires off a handball. 1987 GF - Justin Madden contesting a throw-in.